The weather that is. 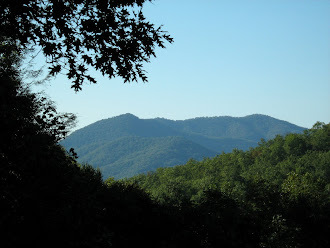 I know it has to do with the way the Appalachian mountains ebb and flow for miles. I know it has to do with the rolling peaks dotted with valleys that create updrafts and down drafts and wind shear and such. I know it has to do with Mother Nature. I know it has to do with human limitations and error. I'm standing here at my computer looking out my window...this is what I see. It's been gently snowing since the sun rose. There was no indication of our getting any snow until after it was already snowing here...it was all supposed to be south of us. My happy obsession with it keeps taking me outside to watch it fall. The really nice thing about this particular snow event is it isn't windy, so the snow is resting where it lands, giving new definition to the twisted limbs that fill the woods. It's stunning. It's falling a little faster now. I'm a happy snow lover! It's beautiful, indeed -- but how thankful I am for a (relatively) warm house. I love snow and snowing...in photos/videos only. Hugs! I'll do my best Margy, there's nothing like a good snow in winter! I have to agree Vicki! How absolutely lovely! I would enjoy seeing some snow, but alas, I have a feeling I won't this season....just don't plan to get to any higher elevations where there is some. It's so beautiful when it happens. I know you have enjoyed it.